United Christian Church going solar - Times Publishing Newspapers, Inc. 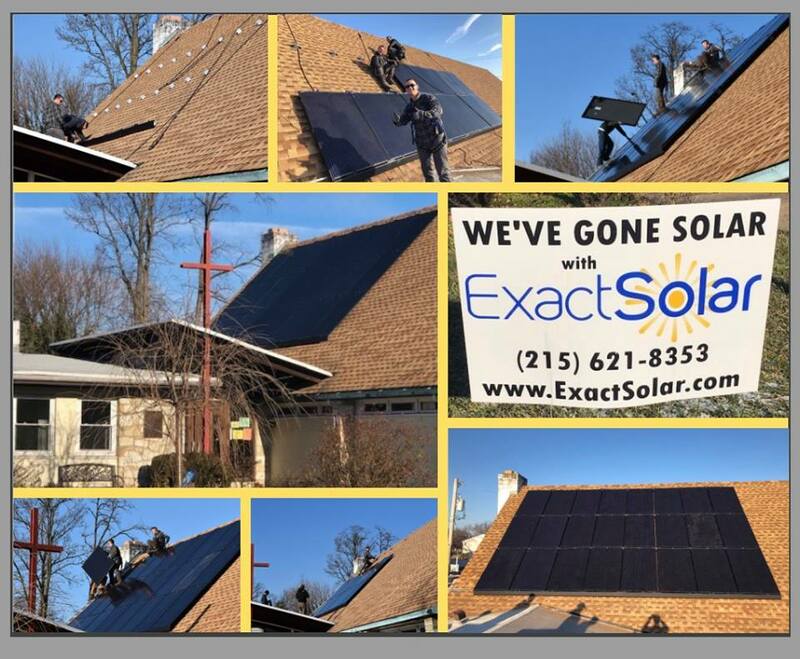 The business, with operations in Lower Makefield and Newtown Township, recently donated and installed a seven-kilowatt solar photovoltaic (PV) system onto the roof of the church off New Falls Road in Bristol Township. The system includes 24 solar panels, said Dara Bortman, Exact Solar’s senior vice president of sales and marketing. It will be used to convert solar power from the sun into electrical energy and is expected to generate about 9,000 kilowatt hours (kWh) of electricity per year. Exact Solar’s estimated $22,000 donation included equipment and labor hours. The system is expected to save UCC about $1,000 a year in energy costs, Dara said. The church plans to use the money it had been using to pay electricity costs to expand its outreach, said Bill Garrett, a member of the UCC clergy team who serves as the Master of Administration and Pastoral Care. “We are delighted, pleased and thankful to Exact Solar for honoring us,” Bill said. The donation demonstrates the company is “trying to help the community,” he said. Solar energy “provides clean, reliable electricity, increases consumer choice, and helps homeowners and business owners save money on their utility bills,” according to the Solar Energy Industries Association. It’s also becoming more economical to install a solar energy system, with costs having dropped by more than 70% since 2010, according to the association. The installation of an average-sized residential system had been more than $40,000 but now is roughly $17,000 before incentives. Solar energy systems have a typical lifespan of approximately 40 years and are made of glass, silicone and metal, Dara said. Mark Bortman, Dara’s husband, founded Exact Solar in 2005 out of the couple’s home in Lower Makefield. She started working for the company almost a decade ago. The Bortmans continue to operate their home office as well as a second office at the Exact Solar warehouse in Newtown Township. Most of the company’s 13 employees are based at the warehouse facility. The couple has been involved in environmental advocacy for many years. Exact Solar previously installed solar panels on the Silver Lake Earthship Education Center in Bristol Township, she said. The company also donated the labor to install solar panels at Harry S Truman High School in Bristol Township after students in the Environmental Club raised funds to buy the energy equipment. UCC pays eight cents per kilowatt hour usage for its electricity because it has a commercial electric account, she said. That is about half of what residential customers pay for their electricity. The donated system is expected to cover as much as a half of the church’s electric needs. UCC expects to be able to start using the solar energy system by the end of February. The church is just waiting for PECO’s final permission to turn on the system. “The effects should be felt pretty immediately and will be significant in the summer when we have to cool the building down,” Garrett said. The congregation of roughly 80 is part of the Christian Church (Disciples of Christ) and the United Church of Christ. The solar energy system coincides with the church’s commitment to the community to leave as small a carbon footprint as possible, he said.